Kate Fort Codington was a gracious lady of old-line Atlanta society whose roots were deeply embedded in the Victorian concept of dignity and decorum that characterized the aristocratic “Old South.” (She would, for instance, never serve at a table that was not daintily set, or drink tea from anything but fine china.) However Kate Codington was a universal and totally free soul, offering no allegiance to custom or circumstance, she ranged the farthest reaches of human imagination. 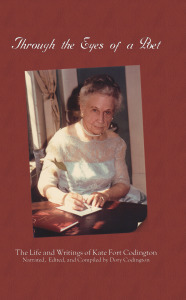 Using her poems and short stories, and a few memoirs of friends and family, her granddaughter has narrated the width and breadth of the life of this amazing woman, and the century in which she lived.